Barbados’ beaches are one of its main attractions, so as you would expect, it has a lot of pretty ones with white sand and clear blue water. The West coast is known to have the nicest beaches for relaxing/swimming, so if you don’t have a specific beach in mind, I would suggest getting on a West coast bus (the route between Oistins – Speightstown) and just getting off when you see a beach that looks good, because you can literally see them out of the bus window. Also, as a general rule, there is some sort of shower/toilet facility at most beaches, and there’s no fee to enter the beach or the facility, which is great. Something that isn’t so great is that if you’re not a family, you’ll probably be offered drugs every time you’re at the beach. That’s what happened to me anyway, and from what I’ve heard, men get offered drugs and prostitutes. They start off with a nice conversation (e.g. “How are you enjoying Barbados?”) and then move onto “So… Do you like marijuana? Coke?”. In my experience they were easy to deter… Just be pleasant (e.g. “I’m loving Barbados, it’s great”) and when they ask about the drugs, just reject them in a light-hearted way like “Ahh it’s ok thanks, I prefer to just stick to rum!”. They were never too persistent with me after that, and I didn’t feel threatened. Another thing to note is that some of the beaches are having problems with seaweed at the moment, turning the sea brown and nasty. This is a problem they’ve had in previous years too, but it’s always changing. If you can, ask someone before you leave your house if the beach you plan to go to has a seaweed problem at the moment, to avoid disappointment. Mullins Beach: This is on the West coast and it’s very family/tourist orientated. The beach is very small and it’s mostly taken up by sun loungers. You will get asked various times whether you want to try any water-sports. They have jet skis, boat tours, banana boats, water skiing, and an area with kids’ attractions in the sea (a trampoline and inflatable climbing wall/cliff thing) which you can buy a wristband for, giving your children as much use of it as they want. There is also a beach bar/restaurant which was very different from the little places I’d been eating at prior to that. The prices are around $40BDS and they play American pop music, so it’s not really a ‘local’ experience. Having said all that, the water is very calm and I did enjoy ‘swimming’ (bobbing up and down in the water) there. 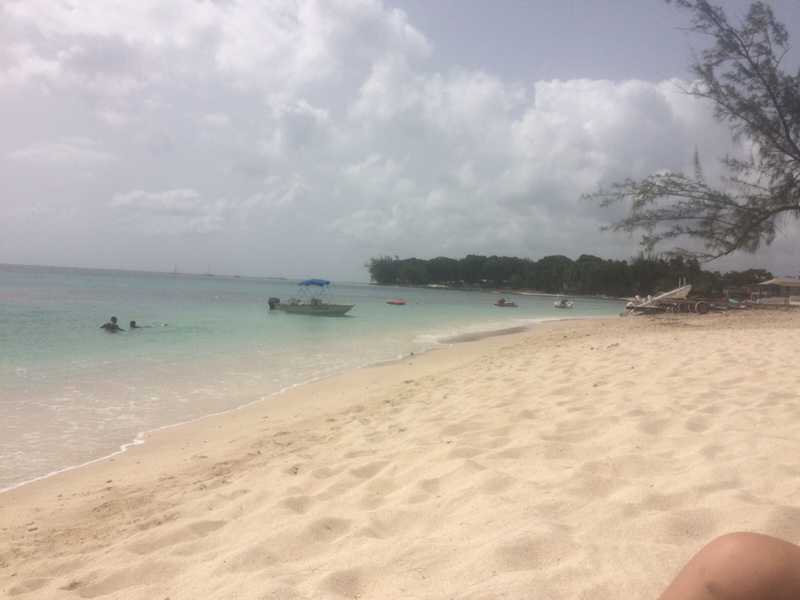 Holetown Beach: This is also on the West coast and it’s a good compromise between a completely empty/natural beach and a completely touristy beach. As you walk in, you’ll be asked by a group of local guys if you’d like to try jet skiing or anything like that, but if you say no and walk on to the beach, you shouldn’t be approached again and the rest of the beach is beautiful and quite empty (no sun loungers etc.). There’s a bar/restaurant on the beach and I didn’t see the prices but I guess it’s a bit expensive. There’s a small roti shop nearby (just ask someone how to get to the roti shop) where I got a vegetable roti for $10BDS. (A roti is like a wrap filled with curry). There’s also a Chinese restaurant nearby with decent prices. 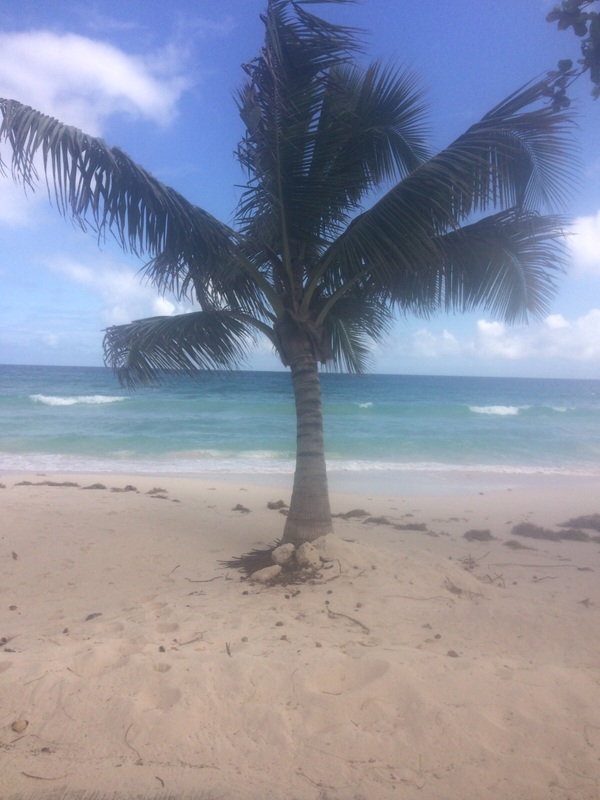 Accra Beach: This is probably the most well-known beach on the South coast. It’s between Oistins and Bridgetown so you can get a bus that goes along that route. There’s a car park just in front of the beach where you can buy souvenirs (jewellery, t-shirts, towels etc.) and there’s often a man selling coconuts there, as well as people selling home-cooked food out of the back of a van. The beach has got some areas where you can just sit on the sand, but there are also a lot of sun loungers for rent. There are plenty of food options across the road if you don’t want the food from the vans. Brownes Beach: This is just outside of Bridgetown and I really liked it. It’s quite long so you have a lot of choice about whether to sit in an empty area or an area with sun loungers. There’s also the option of the BoatYard (see website here – http://theboatyard.com/home.html) which is a beach club with sun loungers, a sea trampoline, cocktails, food and games. Personally I didn’t go there but I heard it’s fun.